Capoeira Angola is an Afro-Brazilian art form–a fluid, rhythmic martial art; a ritual; a dance of deceptive vulnerability, wit, and grace. The intricate movements of Capoeira Angola weave tradition, history, spirituality, and philosophy into a uniquely beautiful “game”. Like many African based traditions, it is orally transmitted from masters (mestres) to students. Capoeira was used by enslaved Africans in Brazil to fight against colonial oppression. After emancipation of the slaves, Capoeira continued to develop in Brazil, however, it was outlawed for almost 400 years and so it was practiced in secret. To teach and practice Capoeira Angola was legalized in the 1930’s. It survives because of the wisdom and dedication of a handful of mestres and their students. Played in a circle (roda), the game (jogo) of Capoeira Angola is an improvised combination of movements, a mix of acrobatics, rituals, and dance. 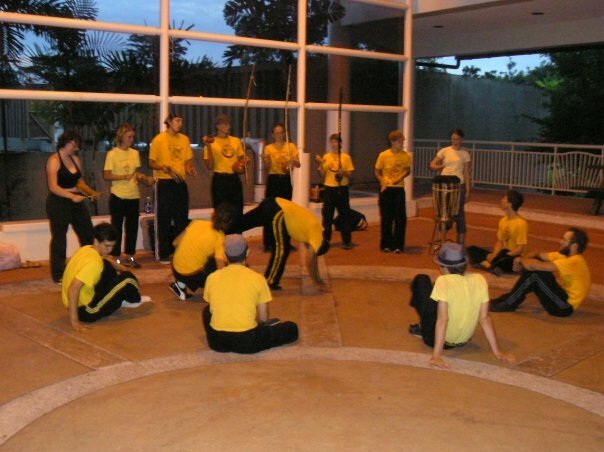 The players respectfully demonstrate their skills in Capoeira while singing songs in Portugese and playing instruments. Today, Capoeira Angola groups flourish across Brazil and around the world. For more information on Capoeira Angola as well as International events check out this awesome blog which serves to collect Capoeira Angola related information and open these archives to the world.